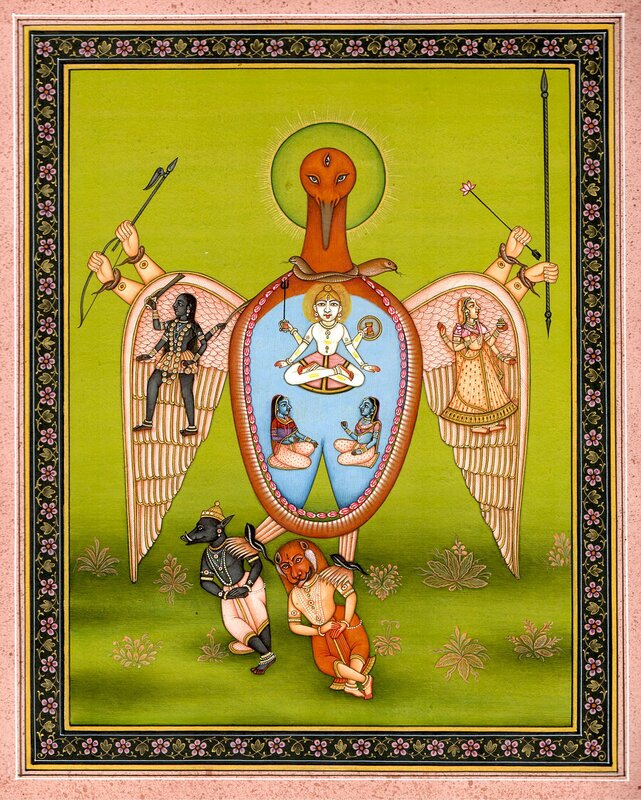 One of the many examples of divine transformation of animal forms into divinities, or gods taking to the forms of animals, something a large section of Indian mythology abounds with and is one of the most astonishing themes of Indian artists, the miniaturists in particular, this painting represents Sharabha, the crane incarnation of Virabhadra who was born of Shiva’s wrath for avenging the death of Sati, Lord Shiva’s spouse, by destroying the yajna of Sati’s father Daksha Prajapati and every other thing related to it. Sharabha, thus one of Shiva’s ‘raudra’ – wrathful, aspects, had incarnated for dispelling the vanity of Varaha and Narsimha, the mighty incarnations of Vishnu. He is known to have vanquished and killed Narsimha and to have worn his skin earning for him and thereby for Shiva whose part Sharabha was the epithet of Narsimhakrittivasana. The mythological tradition as enshrines Shiva Purana, Shatarudrasamhita and other texts perceives Sharabha as Virabhadra’s incarnation who humbled two of Vishnu’s incarnations, Varaha and Narsimha, that having incarnated Vishnu had grown extremely arrogant and were insulting everyone they encountered. They proclaimed their supremacy over all animals, men and even gods. Already annoyed with Vishnu and all his incarnations for taking the side of Daksha Prajapati when he fought for avenging Sati’s death Virabhadra had an opportunity to punish two of his incarnations when their arrogance made them extremely unpopular. Thereupon Virabhadra incarnated as Sharabha, a crane with a huge body, large wings, mighty legs, ‘tri-netra’ – three eyes, and unfathomable might. As prescribes the Sharabha’s iconographic tradition, it has been represented as housing in its wings Mahakali and Parvati, in its main body, Yogi Shiva with Yoginis in attendance, in hands on the right side, a goad and bow, and in those on the left, an arrow and spear. A Tantric vision, while the two Yogini figures define the Muladhara zone close to genetic part that has special significance in Shaivite philosophy, the image of Yogi Shiva enshrines the ‘Atman’ zone that is the universal consciousness. A huge snake moving round its breast, belly and thighs defines the huge bird’s main body. It is wearing snakes as wristlets, necklace and anklets. It is said Sharabha incarnated Virabhadra in the sky wherefrom it landed on the earth and with one claw picked and held Varaha, and with the other, Narsimha and holding them in its mighty claws flew back and disappeared into sky. Narsimha tried to challenge Sharabha. The provoked Sharabha then killed Narsimha and wore its skin. 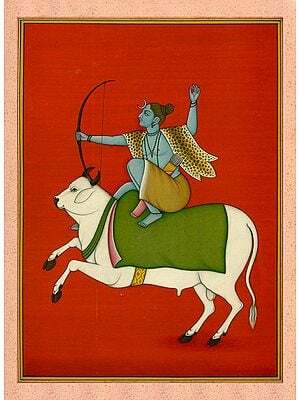 Sati, the daughter of Daksha Prajapati, one of Brahma’s sons, loved Shiva and married him against her father’s wishes. Daksha had enmity against Shiva and insulted him whenever he found any opportunity. Once Daksha held a great Yajna to which even Brahma and Vishnu were invited but Shiva and even Daksha’s own daughter Sati were ignored. Sati felt greatly insulted and in protest wanted to go there and chide her father. Shiva advised her not to go but Sati insisted and went. As she reached the site of the Yajna her father and the host of the Yajna Daksha not only ignored but even insulted her. Desperate Sati, insulted by her own father publicly, jumped into the Yajna-fire and ended her life. The moment the news reached Shiva who madly loved Sati he got so infuriated that his wrath personified and there emerged from it Virabhadra, a great warrior. Shiva ordered him to go and destroy Daksha’s Yajna, his kingdom and him, which after a long battle Virabhadra accomplished. Vishnu was among those who fought on Daksha’s side. This annoyed Virabhadra who in his incarnation as Sharabha destroyed two of his incarnations. Are Sharabha and Sharvesha (Sharbhesha) the same incarnation? If so, what accounts for the different names?